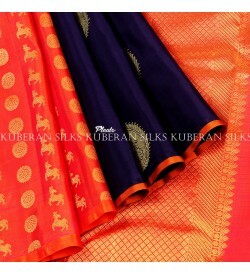 The latest collection from the Kuberan Silks. This designer piece is a handloom woven Kanchipuram Silk Saree.The royal Blue mango motif all over the saree has a golden zari with contrast orange pleats that gives a rich look to the saree. This saree comes with a beautiful Orange blouse. This saree is a SILK MARK authenticated. The colour of the saree is blue in colour which suits for everyone and also attracted by everyone. This saree contains zari border with golden threads. parrot green, pink threads are attached on both sides of the border.